Eva is at it again. This time she is hell bent on invading my community. NIMBY! The neighborhood in which I live is called Astoria in the borough of Queens, New York City. It is culturally diverse with predominately middle and working class families. There is a heavy Greek accent to the neighborhood, even though the Greek influence has certainly waned over the years. It is one of the few neighborhoods left that is both reasonably priced and near Manhattan. In short, our neighborhood has been getting along just fine. The public schools, generally speaking, have also been getting along just fine. Our largest high school, Long Island City, has a beautifully modern facility built by the same people who did the new Stuyvesant High School campus. The DOE has done everything in its power to destroy LIC, since such a wonderful building is prime real estate for charter school operators. While LIC teeters on the brink, the DOE is going out of its way to set the other schools in the community on the road to ruin. Take the example of P.S. 122. It is a Kindergarten through 8th grade school that has served the Astoria community for the past three decades. The middle school portion has one of the best gifted and talented programs in the city, known as the Academy for the Intellectually Gifted. Using the DOE’s favored standard of judging schools (test scores) the Academy has been flourishing since its inception. So, in the world of the DOE, it makes sense to get rid of it. The DOE wants to reduce the Academy’s share of the middle school from 11 to 3 classes. They then wish to increase overall enrollment, which would turn the Academy into a miniscule rump of a program. 122’s facilities will be taxed to the limit. Some students would have to be scheduled for lunch as early as 9:30 am. If the DOE does not provide the extra resources necessary to deal with the increased student population (and there is no reason to believe they will), enrichment programs like art, dance and health will be the first to suffer. In short, the DOE is on a mission to destroy 122. However, the destruction of 122 is not the endgame. These new students will be siphoned off from the other public schools in the area. While 122’s facilities will be pushed to the limit, the other schools will be underutilized. Underutilized…. Why would the DOE want to create a situation where certain schools will be underutilized? Word around the campfire is that Eva Moskowitz, head of the Success Academy chain of charter schools, has put in an application to co-locate a couple of schools in the district. Her minions have been seen handing out their glossy fliers to passersby. It is not going out on a limb to say that the DOE is clearing out space for Eva’s Success Academy. The upshot of this is that the students of 122, who come from working class families, will have their best ticket to a great educational future choked off. Eva can then swoop in and act as their savior by promising “better” schools. However, all that she will provide are inexperienced teachers who are trained exclusively in test prep. Meanwhile, she can line her pockets some more on the backs of working class children. The PTA of P.S. 122 is having an open meeting tomorrow. They will figure out a plan to fight back against Eva and her merry band of privatizers. I will be there as well representing MORE. It will be 6:3o pm at 21-21 Ditmars Boulevard. If you are in the neighborhood, or can get to the neighborhood, come on out and be on the front lines against the destruction of public education. This entry was posted in An Embattled Career, education reform, Politics, School, teaching and tagged education, Education Reform, Eva Moskowitz, P.S. 122, P.S. 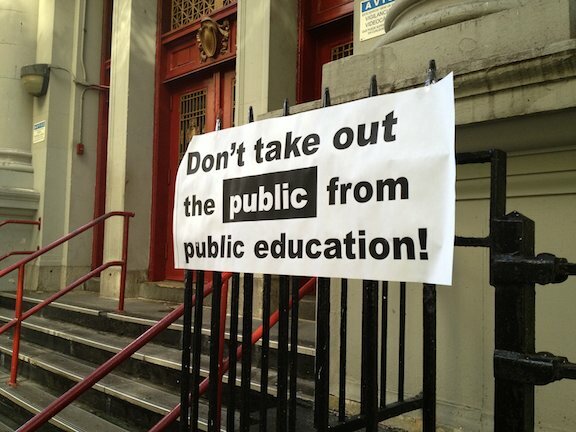 122 Destruction, School, school privatization, Teaching. Bookmark the permalink. Duly noted and changed, Peter.